Spa Robe - Pampering facials, massages, pedicures, and last but certainly not least, the plush robes that leave you craving more. What’s not to love about the sensational experience of a spa? While simple cotton robes are attractive, textured waffle and terry cloth robes offer just a bit more fantastic. They're lightweight and comfortable, and easy to care for which makes them a great intimate apparel basic to have in your collection throughout the year. Super popular, no matter which style you choose, cotton is a natural fabric that breathes and does not retain heat, making it a crisp, cool winner on all counts. Whether you slip this perennial favorite women’s robe on over a short and sassy nightie or your favorite pajamas, it’s easy to see why so many women choose a fresh and fabulous cotton bath robe. When it comes to spa inspired bathrobes, the casual but classic microfiber robe is the quintessential high end hotel and resort favorite that lingerie lovers choose. Whether you're stepping out of the shower or relaxing before bed, these sophisticated, sedate bathrobes take the experience of "slipping into something more comfortable" to an entirely new level. Super soft chenille robes are so super cosy, it's easy to imagine that you're wrapped in a warm and fluffy hug that goes on and on. Thick and surprisingly lightweight, these luxury robes are a perfect choice for post bath and shower, or even lounging in front of a roaring fire during the cold winter months. Affordably priced, chenille robes are one of the most popular sleepwear styles, offering the plush feeling of silk robes and the indulgence of cashmere robes, without breaking the bank. Chenille is easy to care for and wears incredibly well. The best part - it's machine washable, which is a definite bonus for today's busy woman on the go. Spa robe favorites become more luxurious when you pick a tasteful, elegant color that stands the test of time and always looks great. These colors are always chic and will coordinate with any of the intimate apparel or sleepwear that you already have in your collection. Despite a reputation of often eye-watering prices, nothing is quite as glamorous or luxurious as a stunning silk robe. Smooth, sensational, and oh so soft, womens silk robes are the ultimate in elegant decadence. 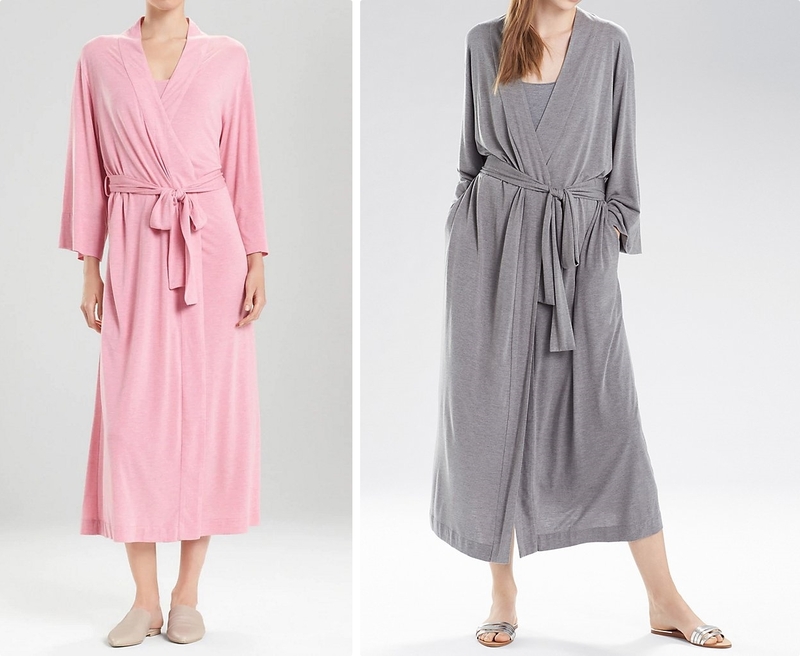 Gossamer thin and surprisingly cozy, these ladies robes instantly boost the wow factor of everything you pair them with - from basic nightgowns and sleep shirts to camisoles and matching tap pants. Stunning and classic silk is a beautiful sleepwear topper that simply goes with everything in your lingerie drawer.